On a layout based on the Canadian Prairie, you need a lot of grain cars! If you are cheap have a low budget, you might be willing to run the less accurate models for a while. Let’s face it, accurate rail cars are expensive. So you have the choice – do without, while accumulating funds to buy the really accurate models, or make do with foobies / inaccurate models for a while, or maybe even forever. 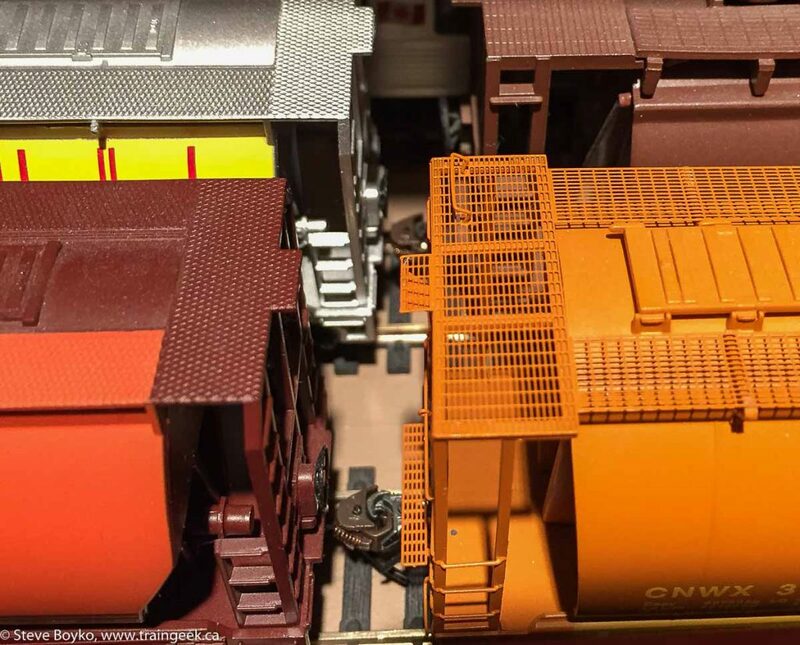 I have a variety of manufacturers’ grain cars on my layout, and I thought I’d write a little post to show the differences between them. But first, a little comparison photo to show differences in detail. Two Bachmanns on the left, Model Power top right, and Intermountain on the bottom right. Here’s a photo of a prototype… ALNX 396247 aka “Lethbridge”, a very typical 4,550 cubic foot grain car built by the thousands for the Canadian federal government and some provincial governments. Eric Gagnon has a great article on these uniquely Canadian cars. What do you look for on an accurate grain car? The most glaring details are the roof walks and end ladders, plus the rib details along the sides. Let’s go. This is a grain car made by Model Power, a manufacturer known for really inexpensive cars. You can see that ALPX 628099 above bears only a passing resemblance to the prototype. This is definitely a low end model. Bachmann makes the Silver Series grain cars in a variety of liveries. These are decent quality cars with metal wheels, Kadee-compatible couplers and finer details than the low end cars. They are still not terribly prototypical but they are decent cars. I wrote about ALNX 396400 already. Intermountain is known for higher quality cars and this one is no exception. It has a number of higher end features but it comes at a premium price. The car I have is a “ready to run” model but I also have four plastic kits that I have not yet assembled. The kits are of good quality with many parts but don’t have the etched metal parts that the ready-to-run version has. Walthers recently announced a limited run of Canadian grain cars based on the National Steel Car 4,550 cubic foot car. They claim to have see-through running boards, finely detailed brake gear, roof hatches and end ladders, with metal 36″ wheels and metal knuckle couplers. They were released in April 2016 but I don’t have any in my fleet. 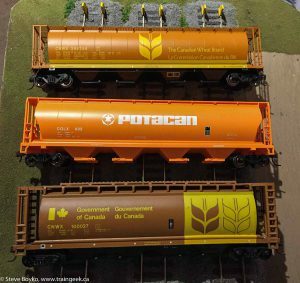 North American Railcar has produced a few runs of Canadian grain cars. One was a special run of Saskatchewan Grain Car green hoppers, based on the Hawker Siddeley Canada 4,550 cubic foot car. They claim to have see-through running boards, finely detailed brake gear, roof hatches and end ladders, with metal 36″ wheels and metal knuckle couplers. They were released in April 2016 but I don’t have any in my fleet. A note about 3800 cubic foot cars: These cars are smaller than the 4550 cubic foot cars above, but have not been available in model form. Some of the paint schemes above are for 3800 ft3 cars but are applied to the 4550s. This is changing as Rapido has announced 3800 cubic foot models for late 2016.